How beautiful is this Paper Pieced Bunny Quilt Wall Hanging made by Cotton Cuts Brand Ambassador Christy? With Easter just around the corner, the bunny wall hanging will be the perfect decor for her coffee table. She used the the Peek-A-Boo Bunny Paper Pieced PDF Quilt Block Pattern by Center Street Quilts. You may find it here. Christy used Bliss fabric by My Mind’s Eye for Riley Blake Deigns. The Bliss line has a stunning metallic finish. The fabric was a perfect match for the Paper Pieced Bunny Quilt Block pattern. Included each month in the Cotton Cuts Classic Box is an inspirational quote. The inspirational quote for February was “The best view comes after the hardest climb.” What do you think of February’s quote? Let us know in the comments below. Did you know with each Cotton Cuts Box you not only receive a box of beautiful fabric, but also a pattern from our Featured Designer. Our February Featured Designer was Kristy Baum From St. Louis Folk Victorian. 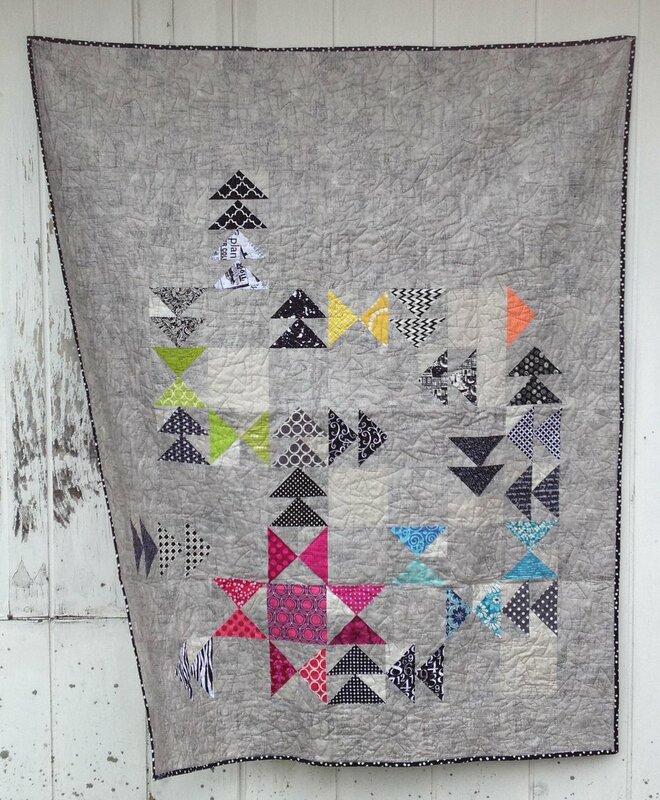 Cotton Cuts members were able to choose one of Kristy’s amazing quilt patterns, including her Star’D Quilt Pattern below. We look forward to seeing more projects Cotton Cuts Brand Ambassador Christy makes from her Classic Box. Please show us your creations and use hashtag #ccfeaturefriday on Instagram to enter to win a 1/2 yard of fabric! Visit the Cotton Cuts Instagram for more information! Not a Cotton Cuts member yet? No problem, use code COTTONCUTS to save 10% off your first month!! Go here to sign up! Older PostIntroducing Brand Ambassador Christy! !